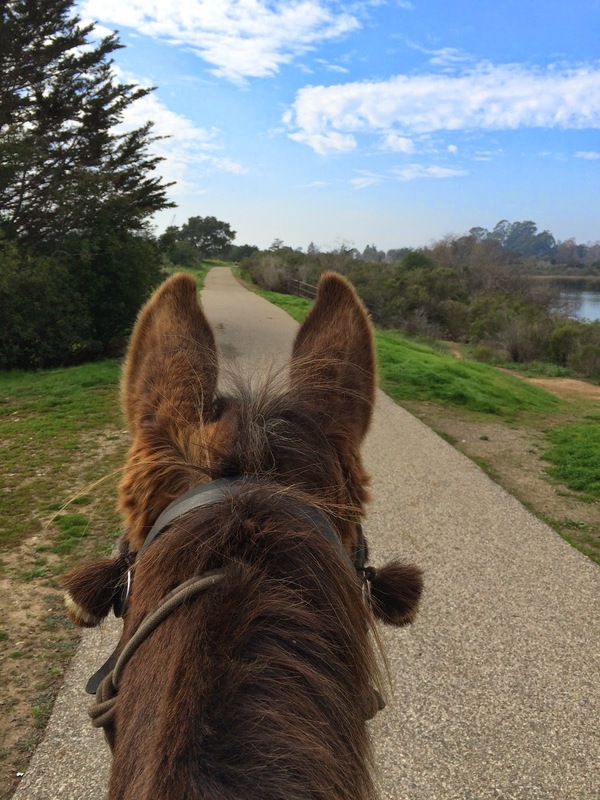 It was with great nostalgia that I met my friend Donna and her quarterhorse Red for a trip around Lake Los Carneros. 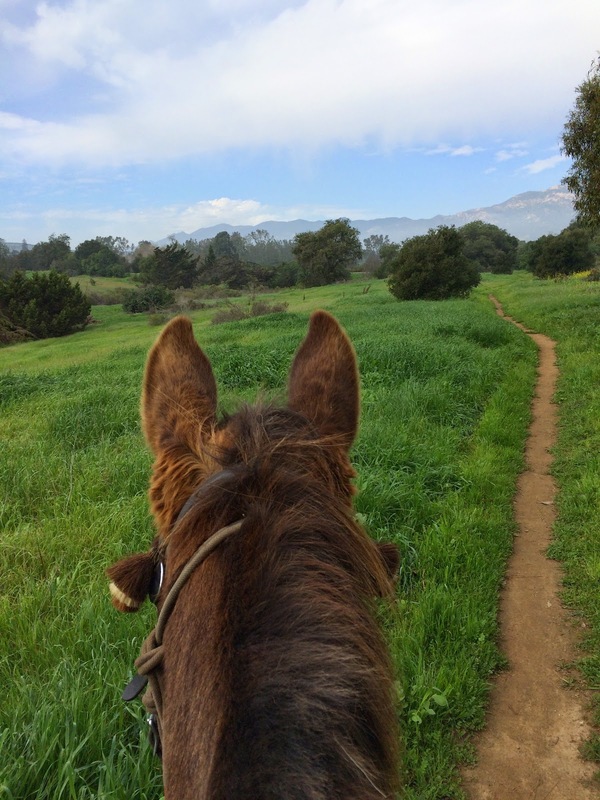 We have ridden here in the past, and Tobe and Red are old pals, so it was fun to be back on the trail together. To access the trails there are turnouts on the edges of the park, on neighborhood streets, but no dedicated parking lot. Oh, the lushness! 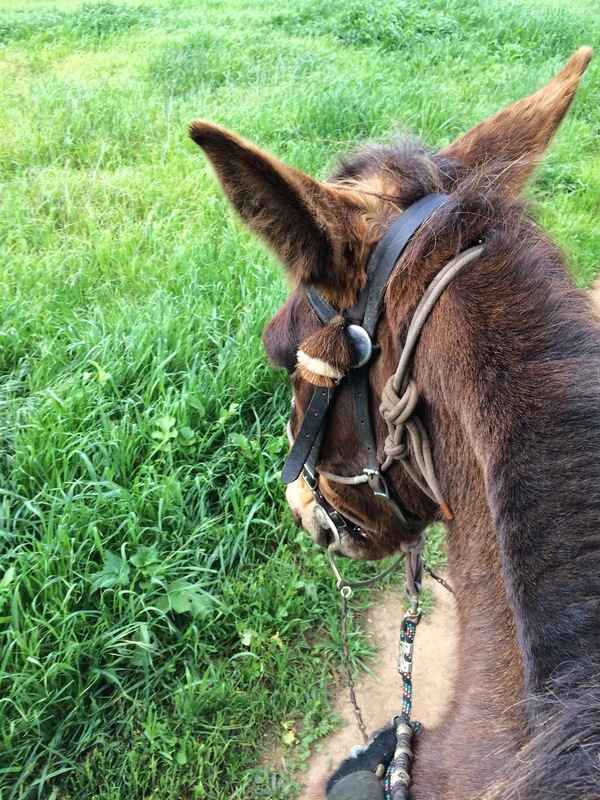 The recent rains have caused a lot of growth, and Tobe was enchanted by the welcoming buffet. But NO! As attractive as the meadow might be, we had a trail to explore. The park is criss-crossed with dirt paths frequented by joggers and dog walkers. Quite a bit of the park is made extremely accessible with paved roadways that lead out into the lake area. 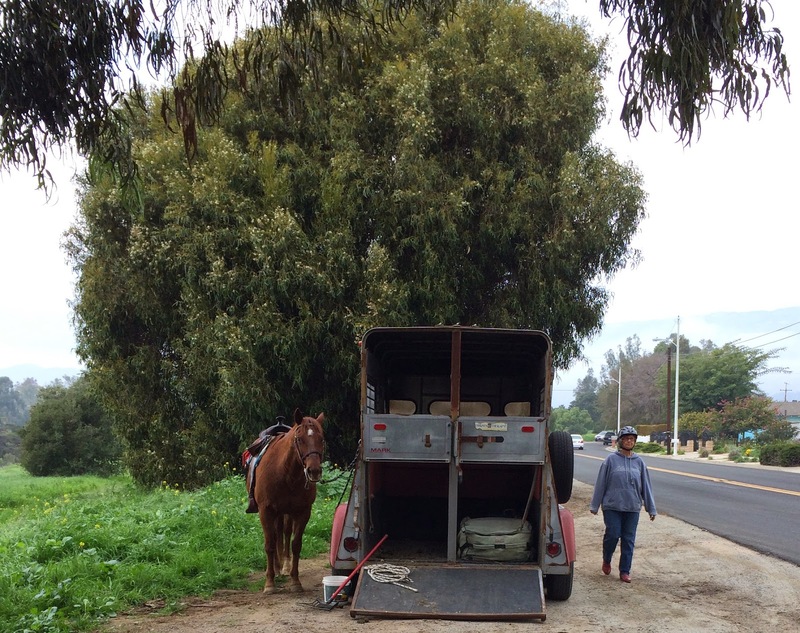 These ladies with 4 little boys and a dog were out for a stroll and the kids lit up when they saw the horse and mule. We stepped over to give them plenty of room, the women certainly had their hands full! 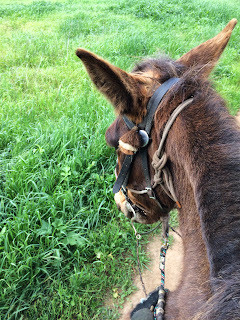 I always like to make sure kids (and adults too) are made aware of Tobe being a mule. I'll confess to always pointing out "Bigger ears, and a bigger brain, too!" Serene and filled with many kinds of birds, Lake Los Carneros is a jewel of open space in the midst of the urban area. The lake was already part of the property when the Stowe family purchased the land in 1871. Their descendants later donated the land to the County to be a park. The seagulls are lined up enjoying the view, and Tobe is keeping an eye on them. Coming up out of the lake area we spy the Train Depot through the trees. 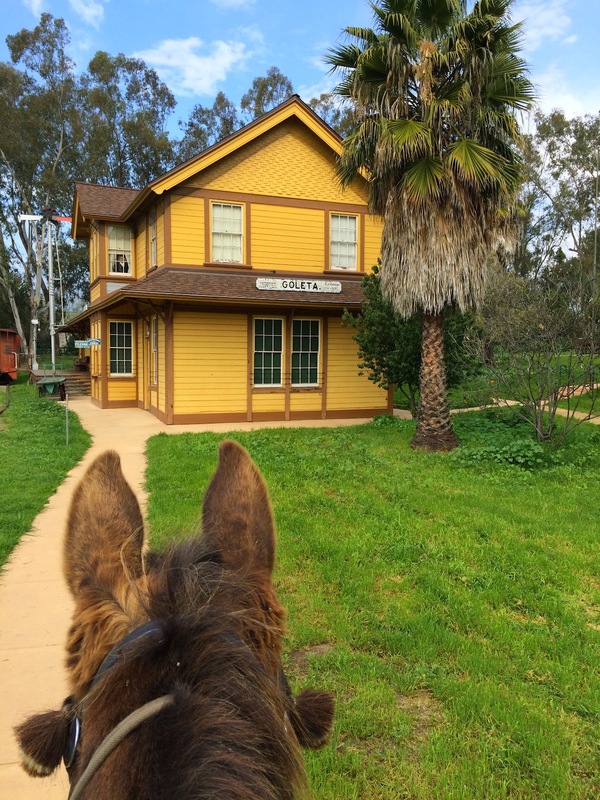 The old Goleta Railway Depot was built in 1901 and then moved from its former trackside location to rest amongst the eucalyptus in this County Park. Many of the acres around the buildings are landscaped with old specimen palms and fine stonework walls. We couldn't quite tell what was going on here, it looked quite boggy with standing water and it was not tempting to go past the hazard fence. Around and around we went. There really is only one mile of trails in the park, but as you can see from the map we turned it into three by doubling back and around. Winding along the paths, again and again you are brought back to lakeside views, quite soothing and peaceful. The road less taken or the straight ahead? Maybe both! we were just out for a stroll, enjoying the new growth and the feeling that the recent rains had revived the land and encouraged Nature to put on her best finery. But finally the ducks were leaving, and so must we. Back to the trailers, back to the home paddocks, pleasantly tired from our hour exploring this little slice of heaven in our very own back yard. We were out for 90 minutes, and we were actually in motion for 60 minutes of that. Starting at almost sea level, 26', we ascended 109' going up and down little hills. I would consider this an extremely easy trail for anyone to walk or ride.